Real Estate – rental properties, single family houses, multi-units, even being a realtor on the side can create income. Land – if you own the rights to the land you can rent out the land to someone weather for hunting, farming, or if someone wanted to build on your land. Ads on Blogs, websites, = check out adsense from Google easy way to get started. YouTube – does the camera gravitate to you? Then try out YouTube some people get a nice check in the mail. Side Business – pretty handy at making things, have a creative mind – try making a product to sell to people and online. Ebooks – have a something to say, a story to tell? 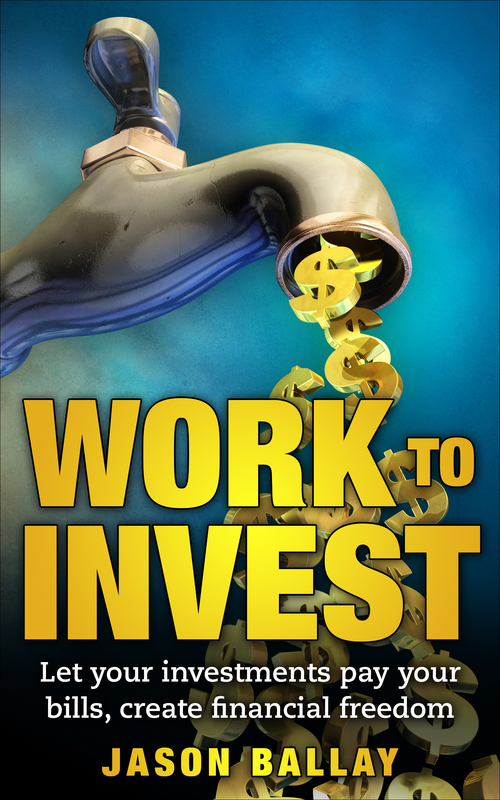 Work to Invest not Work to pay bills – Create multiple streams of income, let your investments pay your bills. This book is filled with tons of tips and links that are very helpful and are great source of knowledge that helps me and will help you. Please allow me to introduce myself… my name is Jason Ballay. Since 2004 I have been investing and in 2014, I had financial freedom (the point where my income equaled the same as my job salary) and each year, my income increases more and more because I reinvest my earnings. 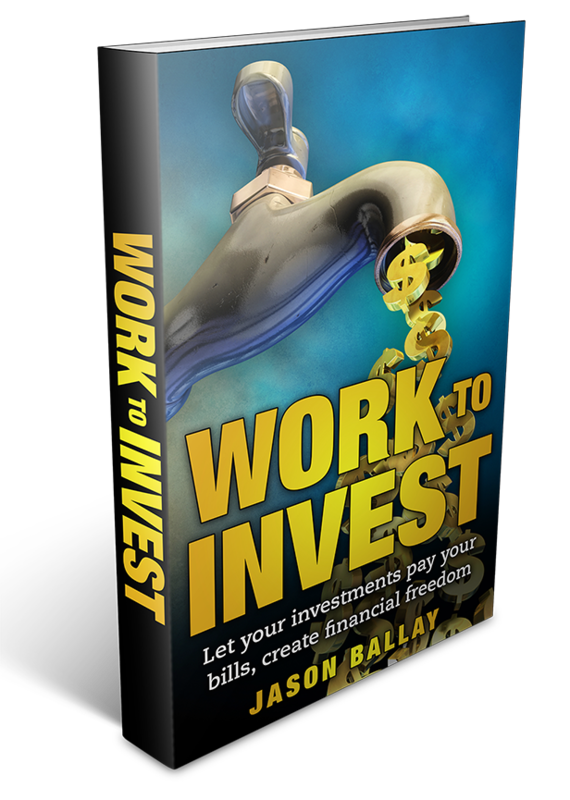 I created this book because people ask me all the time “what should I invest in” and I will ask them how much do you know about investments, and sometimes they would say I know a few things or they will say “not much”. Also, I will ask them “what’s for sale?” Is real estate cheap, what stocks are undervalued or what stocks are paying great dividends? Do they have a business for sale because the owner is retiring and doesn’t want the business anymore? When I ask people these questions, their eyes would light up all big and they would say “you know what, you are right.” You have to invest in the things that have great deals. It is one of the best feelings to have when you are working to invest in your portfolio of investments (real estate, stocks, and businesses) and not to work because you need to pay bills and make ends meet. Living pay check to pay check is not the best way to live. I remember being at work on a Thursday and I walked to the front desk and saw about 10 of my coworkers waiting. I asked the clerk behind the desk “what is everyone waiting for?” And the clerk said, “It’s Thursday and they are waiting for their paychecks and the checks are late.” I saw one of my coworkers and I asked him “why are you here on your day off,” he said “I have to get my check,” I asked him “why don’t you get it on Friday when you come back to work?” He said, “I can’t because I need to pay rent, the light and water bill.” This way of living is very hard on a family. Another reason I created this book is because I was tired of seeing my coworkers, vendors, brokers and friends lose their jobs and they had nothing to fall back on. Nothing that would pay any bills and help out with other payments. Well, I know what you must be thinking now… Jason, they have a severance package that would sustain them till they find something else. I only know of two people that received such a package vs over 20 workers that lost their job and had nothing other than some life savings of less than 6 months, 401K saved up or some vacation time that was left over. Also one of the persons that received a severance package is still working because it’s not enough to live off of and he wanted something else to do rather than stay at home since he was about to retire. Want to read the rest of the book? Buy it on Amazon $2.99 – Click Here… Looking for more advice, tips, and information than check out the rest of my blog.